Duncan Card is a Senior Partner at the prestigious Canadian law firm of Bennett Jones LLP, where he leads several global practice groups related to: Technology; FinTech; Outsourcing & Managed Services; Enterprise Transformation; Government Contracting; Defence & Security; Procurement Transactions (Best Practices); and, Large Infrastructure Projects (energy, airports, intelligent infrastructure). 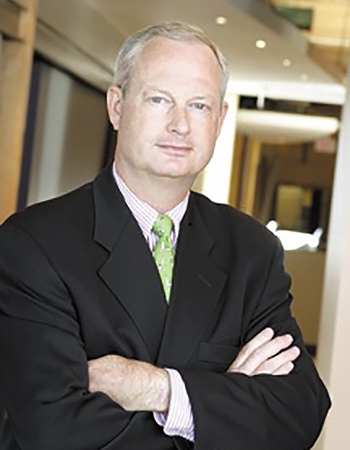 From 2014 to 2018, Duncan established and managed Bennett Jones’ Bermuda office, Bennett Jones (Bermuda) Ltd., where Duncan and his firm were retained, among other large commercial mandates, as: Chief Counsel to the Government of Bermuda (Deputy Premier and Minister of Finance) to structure, negotiate, finance and close Bermuda’s 30-year national airport redevelopment project; Chief Counsel to the Government of Bermuda (Cabinet and Minister of Economic Development) to successfully negotiate and win Bermuda’s appointment as the Host Venue for the 2017 America’s Cup Yacht Challenge; and, as the lead legal advisors to sell Bermuda Telephone to Digicel International. Duncan Card is an experienced corporate director in both the for-profit and not-for-profit sectors. Duncan has taught corporate governance courses, delivered University lectures, and is widely published in the field of corporate director duties, best practices and on the topic of governance and oversight of corporate technology, transformation, data protection, and cybersecurity best practices. Duncan has taught the Technology Corporate Governance Module for the Institute of Corporate Directors for eight of that programs cohorts, and in 2013, Duncan graduated with his ICD.D designation, as Class Valedictorian, from the ICD and University of Toronto’s Rotman School of Business. Duncan is included in the 2018 inaugural edition of Who’s Who Legal: Data as a world leading Information Technology lawyer. Duncan is also identified in the 2018 Chambers Global: The World’s Leading Lawyers for Business, Information Technology as well as Corporate & Finance. Duncan is identified in the 2017 Chambers Global: The World’s Leading Lawyers for Business, Information Technology. Duncan has been included in the prestigious ranking of Lexpert Magazine’s and American Lawyer Media’s ranking of the Leading 500 Lawyers in Canada for 16 years, and he has been recognized in both the 2017 Lexpert Special Edition on Leading Infrastructure Lawyers in Report on Business Magazine and the 2014 Lexpert Special Edition on Leading Energy Lawyers in Report on Business Magazine. He is included in the 2017 Who’s Who Legal: TMT (U.K. publication). Duncan is cited by the U.K. based international professional ranking authority, “Who’s Who Legal”, as the only Bermudian lawyer included in the 2016 prestigious ranking of the leading “Telecommunications Media & Technology” lawyers in the world. Duncan is also included in 2015 Expert Guides, The World’s Leading Lawyers Chosen By Their Peers, Technology, Media & Telecommunications where he is recognized in the Specialty of Information Technology. Duncan is also included in Lexpert Magazine and American Lawyer Magazine’s 2017 joint ranking of the Leading US/Canada Cross-border Corporate Lawyers in Canada, most notably for complex commercial transactions. Duncan has also been cited as one of the world’s leading lawyers in Euromoney Magazine’s Guide to the World’s Leading Technology, Media & Telecommunications Lawyers (U.K. publication) and he is rated in the 2012 British publication, PLC Which lawyer?, published by the UK based Practical Law Company. 2017 is Duncan’s eleventh year of inclusion in Woodward/White’s The Best Lawyers in Canada in The Best Lawyers in Canada in the specialty of Information Technology Law. Duncan is also included in the Who’s Who Legal Canada 2013 for Information Technology. In January 2012, Duncan was ranked as a “Most Frequently Recommended” lawyer in Canada by the Canadian Legal Lexpert Directory. 2011 was the third year Duncan was cited as a leading lawyer in Lawday’s North America’s Leading Lawyers. Duncan serves as a Strategic Board Advisor to the Association of Caribbean Corporate Counsel and has been appointed to the Editorial Board of the Canadian Institute’s IT Law & Technology Journal in 2016. Duncan has also served as a judge for the Bermuda International Innovation of the Year Award in 2015 and 2016. Director, Warner Home Video (Canada) Ltd.
Director, Warner Music of Canada Ltd.
Osisko Bermuda Limited, a wholly owned subsidiary of Osisko Gold Royalties Ltd., which is publically traded on both the Toronto and New York Stock Exchanges. Osisko Gold Royalties Ltd. is an intermediate precious metal royalty company focused on the Americas that commenced activities in June 2014. Osisko holds a North American focused portfolio of over 130 royalties, streams, and precious metal offtakes. Advisory Board EXEN Technologies, Escondido, Calf. 2018 Inaugural Edition of Who’s Who Legal: Data, recognized as a world leading Information Technology lawyer. 2018 Chambers Global: The World’s Leading Lawyers for Business as a Foreign Expert Based in Bermuda, Information Technology. 2017 Chambers Global: The World’s Leading Lawyers for Business as a Foreign Expert Based in Bermuda, Information Technology. 2016 Lexpert/American Lawyer Guide to The Leading 500 Lawyers in Canada, recognized as a leading technology transactions lawyer in Canada (published by American Lawyer Media, New York, in conjunction with LEXPERT Magazine, Toronto, Ontario). 2016, Chambers Global: The World’s Leading Lawyers for Business ranked as a business a leading lawyer in Information Technology. 2016 edition of Who’s Who Legal: Technology, Media and Telecommunications, cited by the U.K. based international professional ranking authority, “Who’s Who Legal”, as the only Bermudian lawyer included in the 2016 prestigious ranking of the leading “Telecommunications Media & Technology” lawyers in the world. 2015 Lexpert/American Lawyer Guide to The Leading 500 Lawyers in Canada, recognized as a leading technology transactions lawyer in Canada. 2014, Chambers Global: The World’s Leading Lawyers for Business ranked as a business a leading lawyer in Information Technology. 2014, Best Lawyers in Canada, recognized as one of Canada’s leading information technology lawyers. 2014 Lexpert/American Lawyer Guide to The Leading 500 Lawyers in Canada, where he is ranked as a “Most Frequently Recommended” lawyer in Canada for Technology Transactions and “Frequently Recommended” lawyer for Computer & IT Transactions, (published by American Lawyer Media, New York, in conjunction with LEXPERT Magazine, Toronto, Ontario). Duncan has been cited in that prestigious ranking for the last 17 years. Duncan has been cited annually in Best Lawyers in Canada (bestlawyers.com) since 2006. Duncan represents numerous Bermuda businesses outside of Bermuda, and he is a frequent speaker at Bermuda AGMs and conferences. Legal counsel for Canada’s first transactions to develop many different genres of highly transformative ( revolutionary ) technology solutions and products, including: transformational IT solutions; hydrogen fuel cells; advanced military high-tech; advanced satellites; robotic manufacturing; and all forms of intelligent infrastructure. Duncan, and his wife Jennifer, have three children. They live in Toronto and Collingwood, and are members of: The Coral Beach & Tennis Club, Bermuda; The Royal Canadian Yacht Club; The Royal Bermuda Yacht Club; Osler Bluff Ski Club in Collingwood Ontario; and, Duncan is a member of the Royal Canadian Military Institute in Toronto. Duncan was an inaugural inductee to the Queen’s University Track & Field Hall of Fame, having been a member of numerous Canadian National Track Teams, a former Canadian National Track Champion (4x100m), and a former National sprint indoor record holder (300m) while at Queen’s University. Duncan has served on the management committee of numerous political campaigns for several politicians he believes in, and he is interested in both corporate-community outreach programs and in the developing field of corporate social responsibility. Duncan is a citizen of Bermuda ( by birth ), Canada ( by choice and divine grace ), and of the United Kingdom ( with deep gratitude ). Managing Principal, Bennett Jones (Bermuda) Ltd.
Card, D. Information Technology Transactions: Business, Management and Legal Strategies, pub. By Thomson Reuters, Toronto. 2007. Hardcover, 339 pages. Can be purchased $350 Cdn from Thomson Reuters at: https://store.thomsonreuters.ca/product-detail/information-technology-transactions-business-management-and-legal-strategies-2nd-edition/ . Card, D. Information Technology Transactions: Legal and Commercial Strategies (2005, United Kingdom edition, Sweet & Maxwell Publishers (London, England); 240 pages, hardcover) (edited by M. O’Conor). Card, D. Information Technology Transactions: Business, Management and Legal Strategies (2002, Canadian edition, Carswell Publishing; 260 pages, hardcover). Card, D., et al. “Cloud Computing: A Primer for Outsource Lawyers” and “Canadian Outsourcing Regulation and Requirements” chapters in the Practical Law Company Outsourcing Handbook 2013. Card, D. Chapter 25, “Information Technology Risk Management”, (Barry Reiter, et al, Directors’ Duties in Canada, 5th Edition, 2012, CCH Publishing, pp 828-846). Card, D. Chapter 19, “Information Technology Risk Management”, (Barry Reiter, et al, Directors’ Duties in Canada, 4th Edition, 2009, CCH Publishing, pp 663-677). Guest Speaker, “Mind the Gap: Corporate Governance & Cyber Security”, ARMOUR EXPO 2017, Cayman Island, September 28, 2017. Guest Speaker, “Privacy, Data Protection & Corporate Governance: Compliance & Risk Management”, ISACA Bermuda Chapter Annual Conference 2016, Bermuda, November 17, 2016. Guest Speaker, “Financing and Delivering Critical Infrastructure: P3 & Outsourcing Models”, Association of Caribbean Corporate Counsel, 4th Annual Caribbean Corporate Counsel Summit 2016, Miami, Florida, September 8, 2016. Panellist, “Bermuda – Capitalizing on Growth!” EY Global Hedge Fund Symposium Series, Bermuda, November 19, 2015. Guest Speaker, “IT Governance & Regulatory Compliance: The New Corporate Reality”, ISACA Bermuda Chapter Annual General Meeting, November 12, 2015. Author, “The 12 Key Risks To Avoid in Commercial Contracts”, presented by Phelecia Barnett at the 3rd Annual Caribbean Corporate Counsel Summit 2015, Port of Spain, Trinidad, November 16th-17th, 2015. Panellist, “Financing The Public Sector Agenda” 2015 KPMG Island Infrastructure Summit, Miami, Florida, October 6, 2015. “Cyber and IT Risk Management Strategies for The Argus Group”, presented to the Board of Directors of The Argus Group, Bermuda, September 21, 2015. Panellist, ISACA Bermuda TechTalk series, panel discussion on “After the Breach- What Now? Damage Control after a Cyber-Incident”, Royal Bermuda Yacht Club, July 23, 2015. Panellist, Institute of Internal Auditors (Bermuda Chapter Ltd.) panel discussion on Cyber Security, Deloitte Bermuda, June 12, 2015. “General business: stability yet innovation” Bermuda Finance Magazine Roundtable discussion, hosted by KPMG, Bermuda, June 12, 2015. Lecturer/Instructor, “IT Governance: Oversight of Information Management”, Rotman School of Management and Institute of Corporate Directors, ICD.D Certification Program, University of Toronto, Toronto, April 17, 2015. C. Card, “Cyber-Security Corporate Governance: Three Essential Steps to Form a Cyber-Security SWAT Team” (2015) 10:1 Corporate Governance Report (pgs. 2-6), LexisNexis Canada Inc., March 2015. Guest Lecturer, “Part I – Corporate Governance: The Perfect Storm Creating Job Opportunities For Lawyers”, Truman Bodden Law School, Cayman Islands, March 27, 2015. Guest Speaker, “Cyber Security: Governance, Compliance and Response Policies”, Federated Press’ 9th Internet Law Summit, Toronto, December 9-10, 2014. Speaker, “General Counsel’s Role in Corporate Governance: From Risk Management to Regulatory Compliance”, 2nd Annual Caribbean Corporate Counsel Summit 2014, Miami, Florida, November 6th, 2014. Speaker, “Legal Considerations of Cyber Security For Bermuda Based Organizations”, IIA/ISACA Bermuda 2014 Annual Cyber Security Conference, KPMG Bermuda, October 3rd, 2014. Author, “Technology Risks Have Changed: M&A Governance and Due Diligence” (2014) 9:2 Corporate Governance Report (pgs. 8-11), Lexpert, June 2014. Author, “Cyber Security Corporate Governance: Three Essential Steps to Form a Cyber-Security SWAT Team”, Bennett Jones Technology Law Update, May 2014. Guest Speaker, “Cyber Security: Governance, Compliance and Response Policies”, Federated Press’ 8th Internet Law Conference, Toronto, December 17, 2013. Interviewee, “Cross Border Corporate Governance and Cyber Security” article by Julius Melnitzer appearing in The Border column in Lexpert Magazine (June, 2013). Speaker, “IT Governance Overview”, CIPS and ISACA How to Successfully Implement and Sustain Exceptional IT Governance Seminar a Bennett Jones LLP In-house Seminar, Toronto, February 26, 2013. Author, Chapter 25, “Information Technology Risk Management”, (Barry Reiter, et al, Directors’ Duties in Canada, 5th Edition, 2012, CCH Publishing, pp 828-846). Lecturer/Instructor, “IT Governance: Oversight of Information Management”, Alberta School of Business and Institute of Corporate Directors, ICD.D Certification Program, University of Alberta, Edmonton, May 4, 2012. Card, D., “The Corporate Governance Context of Information Technology Transactions”, (Chapter 1) in Duncan’s book, Information Technology Transactions: Business, Management and Legal Strategies (Carswell Publishing, Canadian Second Edition, 2007.) Hardcover, 367 pages. Co-author, “Ensuring Governance Oversight of Shared Services and Management Services Agreements Among Affiliated companies: Part II – Disclosure Obligations”, Bennett Jones IT & Computer Law Update, March 2012. Lecturer/Instructor, “IT Governance: Oversight of Information Management”, Rotman School of Management and Institute of Corporate Directors, ICD.D Certification Program, University of Toronto, Toronto, January 27, 2012. Co-author, “Ensuring Governance Oversight of Shared Services and Management Services Agreements Among Affiliated companies”, Bennett Jones IT & Computer Law Update, January 2012. Author, “IT Compliance Alert: Cybersecurity Corporate Governance” article, Canadian Bar Association’s National Magazine, January 2012. Author, “Cybersecurity & Corporate Governance: SEC Releases First-Ever Guidance on Cybersecurity Risks Disclosure”, Bennett Jones IT & Computer Law Update, November 2011. Lecturer/Instructor, “IT Governance: Oversight of Information Management”, Rotman School of Management and Institute of Corporate Directors, ICD.D Certification Program, University of Toronto, Toronto, November 25, 2011. Keynote Speaker, “IT Governance: From Compliance to Procurement Transactions”, IT.Can’s 10th Annual IT Law Spring Training Program, Toronto, May 27, 2010. Keynote Speaker, “Compliance With Essential Business Operations Governance Duties”, Federated Press’ Best Practices for Audit Committees Conference, Toronto, May 31, 2007. Guest Speaker, “Cyber Security & Cyber Warfare: Governance of IT Infrastructure”, Ministry of the Attorney General, E-government Practice Group, Province of Ontario, January 14, 2011. Speaker, “Corporate Governance and IT”, CIO Summit IT Leadership Development Program, King City, Ontario, November 4, 2004. Conference Co-Chair and author of paper, “Infrastructure and Corporate Governance”. Presented at Information Technology Law for Corporate Counsel: Intensive IT Law Training Program (Joint Program between Canadian IT Law Association and Canadian Corporate Counsel Association). Toronto, October 22, 2003.